ACL reconstruction is a surgical procedure to make a new ligament for someone who has sustained an ACL tear. Once an individual has decided to have surgery, they will need to decide how the surgery will be performed. The most common question patients face is: which type of ACL graft should they choose? The ACL graft is the type of tissue used to make a new ligament. ACL reconstruction can be done with several different graft choices. These most common options include patellar tendon, hamstring tendon, and donor tissue (allograft). Each of these choices has advantages and disadvantages. ACL surgery is common, but not correctly, referred to as an ACL repair. A repair implies that you can fix something that is broken. If an ACL is completely torn, the ends of the torn ligament will not heal back together, even if the torn ends were sewn together. What does work well, is to remove the torn ends of the ACL and replace the ligament with a different structure -- called an ACL graft. A graft is a tissue that is moved from one location to another. When the source of the graft is from the individual having surgery, it is called an autograft. When the source is from a donor (cadaver), it is called an allograft. To secure the grafted ligament into the position of the normal ACL, tunnels are made of the shin bone (tibia) and thigh bone (femur), and the graft is passed through these tunnels to reconstruct the ligament. The patellar tendon is the structure on the front of your knee that connects the kneecap (patella) to the shin bone (tibia). The patellar tendon averages between 25 to 30 mm in width. When a patellar tendon graft is selected, the central 1/3 of the patellar tendon is removed (about 9 or 10 mm) along with a block of bone at the sites of attachment on the kneecap and tibia. Advantages: Many surgeons prefer the patellar tendon graft because it closely resembles the torn ACL. The length of the patellar tendon is about the same as the ACL, and the bone ends of the graft can be placed into the bone where the ACL attaches. This allows for "bone to bone" healing, something many surgeons consider to be stronger than any other healing method. Disadvantages: When the patellar tendon graft is taken, a segment of bone is removed from the kneecap, and about 1/3 of the tendon is removed. There is a risk of patellar fracture or patellar tendon tear following this surgery. Also, the most common problem following this surgery is a pain on the front of the knee (anterior knee pain). In fact, patients sometimes say they have pain when kneeling, even years after the surgery. The hamstring muscles are the group of muscles on the back of your thigh. When the hamstring tendons are used in ACL surgery, two of the tendons of these muscles are removed, and "bundled" together to create a new ACL. Over the years, methods of fixing these grafts into place have improved. Advantages: The most common problem following ACL surgery using the patellar tendon is a pain over the front of the knee. Some of this pain is known to be due to the graft and bone that is removed. This is not a problem when using the hamstring tendon. The incision to obtain the graft is smaller, and the pain both in the immediate postoperative period and down the road is thought to be less. Disadvantages: The primary problem with these grafts is the fixation of the graft in the bone tunnels. When the patellar tendon is used, the bone ends heal to the bone tunnels ("bone to bone" healing). With the hamstring grafts, a longer period of time is necessary for the graft to become rigid. Therefore, people with hamstring grafts are often protected for a longer period of time while the graft heals into place. Allograft is most commonly used recreational athletes (as opposed to competitive athletes), or patients who are undergoing revision ACL surgery (when an ACL reconstruction fails). Studies have clearly shown that allograft (donor tissue from a cadaver) is not as strong as a patient's own tissue (autograft). For many patients, however, the strength of the reconstructed ACL using an allograft is sufficient for their demands. Therefore this may be an excellent option for patients not planning to participate in high-demand sports (e.g. soccer, basketball, etc.). 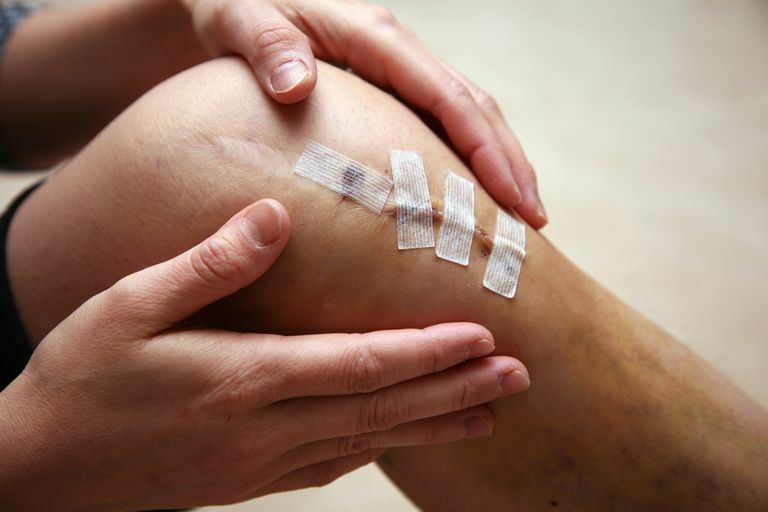 Advantages: Performing ACL surgery using allograft allows for decreased operative time, no need to remove other tissue to use for the graft, smaller incisions, and less post-operative pain. Furthermore, if the graft were to fail, revision surgery could be performed using either the patellar tendon or hamstring grafts. Disadvantages: Historically, these grafts were of poor quality and carried a significant risk of disease transmission. More recently, techniques of allograft preparation have improved dramatically, and these concerns are less of an issue. However, the process of graft preparation (freeze-drying), kills the living cells and decreases the strength of the tissue. There is also the concern of disease transmission. While sterilization and graft preparation minimizes this risk, it does not eliminate it entirely. Many surgeons have a preferred type of graft for different reasons. The strength of patellar tendon and hamstring grafts are essentially equal. There is no right answer as to which is best, at least not one that has been proven in scientific studies. The strength of allograft tissue is less than the other grafts, but the strength of both the patellar tendon and hamstring tendon grafts exceed the strength of a normal ACL. The bottom line is 85% to 95% of patients will have clinically stable knees following ACL reconstructive surgery.